Recently, one of our more flamboyant seasonal residents has been performing at a variety of obscure local venues, venues that you might describe as off-off-off Broadway. Performances generally take the form of a one man show, and they only work nights, so don’t even think about catching a matinee. I am of course referring to the American woodcock. Since at least late February, these hardiest of our local shorebirds have been performing their aerial display flights in fields and woodland clearings all across the Cape. Each show, which may be performed dozens of times per night, starts with a ground-based vocal display, commonly known as “peenting”, followed by a combined audio/visual aerial display consisting of a spiraling, twittering climbing phase and a chirping, falling-leaf-style descent. The performers are all males, and they are of course seeking the attention of lady woodcocks, who are quietly watching from the wings, if you will. Once she has selected her guy and the mating is done, she is on her own, for the male woodcock is 100% devoted to the stage. He will continue displaying every night while the female does all of the incubating and chick rearing. Hummingbirds also follow this breeding strategy, where the male does nothing but display and has no role in the actual nesting and chick rearing. Like other species taken by rural hunters, the woodcock has accumulated many colorful local names. The most familiar one is “timberdoodle”, but other, more evocative monikers apparently include bog sucker, night partridge, and, my personal favorite, the Labrador twister. Brilliantly camouflaged in their forest floor environment, woodcocks are basically living clumps of leaf litter, making them nearly impossible to find in dense cover. 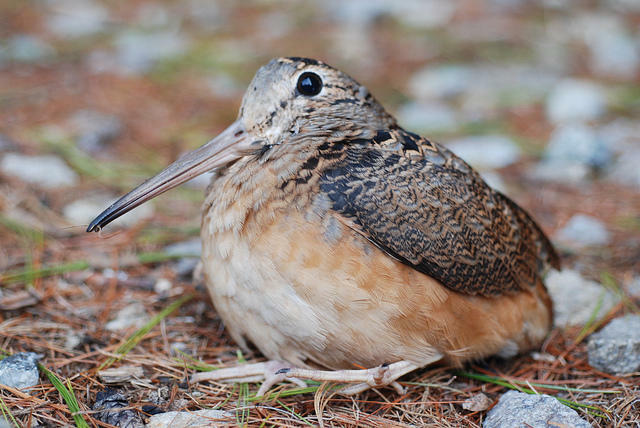 But when caught crossing roads or other open areas, woodcocks have a charmingly ineffective way of trying to remain unnoticed, in which they rock their body back and forth like Elvis thrusting his way across a stage – think 70’s Elvis: the woodcock is not a slim bird. As a result, they have their own internet meme, and you can find numerous videos of woodcocks rocking and rolling their way across a road set to various kinds of music. Some anecdotal evidence indicates the rocking dance may also serve to bring earthworms, which are overwhelmingly their favorite food, up to the surface where they can nab them with their highly sensitive and weirdly flexible bill tip. As their young forest and shrubland habitat succeeds to mature forest or is converted into subdivisions, woodcocks have been on the decline, and are a species of management concern for various state and non-government agencies. But here on the Cape where young woodlands and wet thickets abound, they are still easy to find. Woodcock walks are a staple offering of nature centers and bird clubs everywhere in the eastern US, so you can probably find one near you. Wellfleet Bay Wildlife Sanctuary’s April 7 walk is already full, but another is scheduled for April 14. Or just find you own locally performing woodcocks at the edge of some wet thicket and settle in for the show. Tickets are free, but don’t wait – performances only run through May. This piece first aired in March, 2016. Last week I started an in-depth look at bird feeding including why we do it and whether it actually helps the birds. If you missed it, the results are mixed, but studies do show that, as you may have suspected, feeding birds can increase their health and survival. On The Point's monthly birds show, we discuss the seasons's news from the avian world. Who's nesting already, who's arriving from afar, and how to protect their habitats. We get tips on how to design our landscapes to maximize the attractions for birds: a diversity of forage is the key. Mike Tucker, naturalist, is our guest. While it seemed like we might get away with leaving the shovels in the shed this year, it looks like winter finally caught up to us. I, for one, don’t mind a little snow on the ground, notwithstanding the 8-foot-wide plow ridge they inexplicably left in front of my mailbox. Snow means an opportunity to track wildlife, one of my favorite outdoors pursuits. And, more appropriately for our purposes, it means more birds at the feeder. So, let’s take a closer look at this curious and surprisingly recent American pastime: feeding the birds. I’ve had the opportunity to spend time in northern New England a couple of times in recent weeks. I often feel drawn to the woodsy wildness of our northern states, even in winter. The big, girthy birches and huge hemlocks, the Christmas tree smell of Balsam fir, the crunch of snowshoes breaking the heavy, snowy silence of those north woods. When it comes to late winter on Cape Cod, and the knowledge that beach weather is still four months away, it’s the little signs of better things to come that keep you going. If you are paying attention to the birds around you every day, you should be brimming with hope, because they clearly are, too.